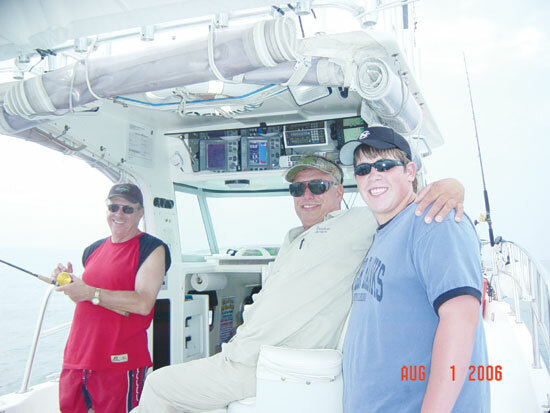 A fishing trip photo of the author's son Andrew on the Rainbow with Captain Jerry and Captain Bob Rochetta. He wasn't giving away any info, not if he could help it. Blackfishing is not always that secretive, but, in my opinion, is certainly the most challenging of all of the L.I. species to catch. At times, it is the most frustrating fish to capture. I have been humbled on more than one occasion by not catching fish while others around me were bailing fish one after another. And at other times, I've caught like a blackfishing superstar. That's what makes it interesting and fun. You never know what it's going to be like. Besides the angling skills, one must know how to maneuver the boat over a wreck or a rock pile with pinpoint precision. Anchoring skills are also extremely important. On top of those factors, togging is not for the fair-weather angler. Many days we are braving harsh north winds with cold temps. It takes a special type of person to enjoy the entire togging scene. KL: Tell us about your "SPORTFISHING ON LONG ISLAND" program and what people can expect from it. Why do you do it? JM: People can expect to learn more about fishing, no matter what level they are at. I have taught successful charter captains and rank beginners. Each class member receives over a hundred pages of handouts which are easily transferred into a loose-leaf binder full of valuable tips and techniques which I have shared from my 50 years of fishing experiences. Completing the entire program is a starting point for students. Implementing the newly learned techniques is equally important and that's where the role of the optional field trips comes in. Currently, for the 2008 season, we have 20 charter excursions scheduled for catching striped bass, blackfish, fluke and porgies. 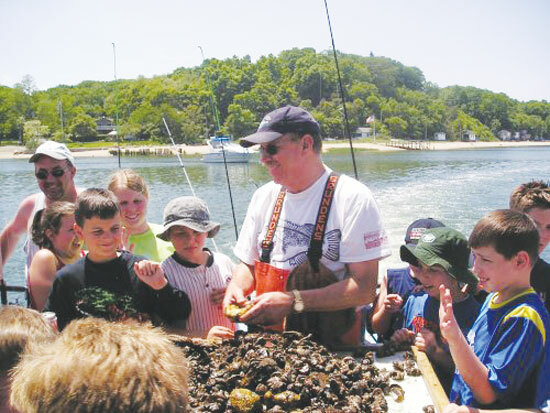 These excursions not only give students a way to practice what he/she has learned, but it gives them the opportunity to leave the classroom and see what it is like to fish on some of the best charter boats on Long Island. Why do I do it? The rewards for me are numerous, and the field trips are certainly some of the best parts. I get to catch fish without worrying about running a boat, I can mingle, joke around and have fun, and at the end of the day, the cleanup is left to the crew and I go home with a bag of fresh fillets for dinner. Sometimes, I ask, "Who's got it better than me?" I love my job! 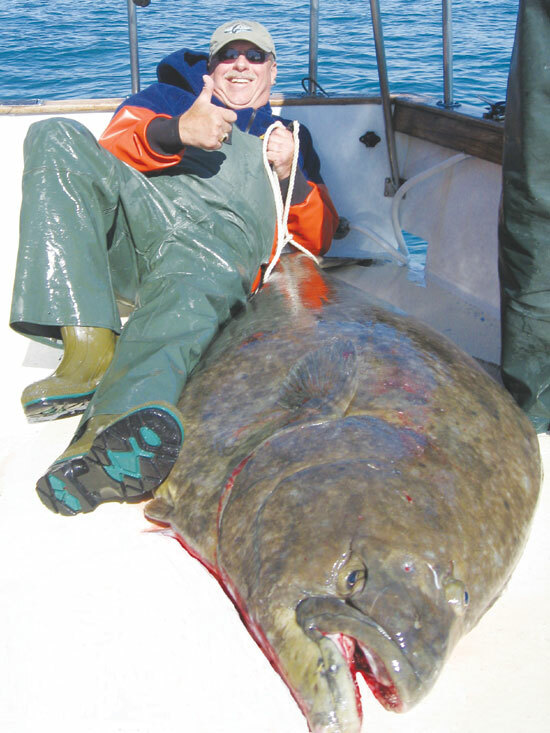 Captain Jerry with his 214-pound barn door halibut! KL: I hope to be so lucky myself one day. Tell me about your favorite fishing days and what made them so special. JM: There have been many of them, especially those involving large fish. However, two days stand out over the last 10 years. One was while fishing at Elfin Cove, Alaska. Prior to that day, I had caught my share of salmon, rockfish and smallish halibut. But it was the big, massive barndoor that I was really after. I had been salivating and dreaming for years about catching a monstrous halibut. And there I was at Middle Pass in the Icy Strait with Capt. Mike Nichols still trying to catch one over 50 lbs. after nearly 7 full days of trying. I had watched others catch the big guys, but there were none for me. Capt. Mike called for the last drift of the day and announced, "Don't forget, let the fish eat the meat!" Two minutes later, a 187-lb. barndoor swallowed my bait resulting in my dream coming to life. It was so sweet to catch that behemoth, mostly due to the slump I had gone through prior to that. Captain Jerry teaching some future blackfish anglers about bait.